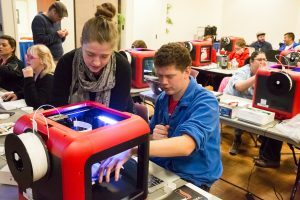 This year the i-STEM Institute at Lewis-Clark State College (LCSC) in Lewiston will be June 17-20. Over these four days, participants attend a workshop strand, participate in general sessions with keynote speakers and network with other educators. Participants leave with a kit of materials related to the workshop strand they attend, ready to implement what they have learned into their teaching environments. This professional development opportunity is open to formal and informal educators. APPLICATION TO ATTEND IS CLOSED. Successful applicants will be notified in early April by STEM Action Center. Participants will use Lego kits to create stations that you can be used in their learning environments in a variety of ways to foster self-directed learning with their students, to promote STEM learning and to create new ideas. Some examples of this are creating a dam to prevent flooding, construction of a bridge, and creation of a car powered by air. Particular focus will be on the Science and Engineering Practices of the Idaho Standards. There will also be a field trip to observe a variety of job in STEM careers, and gain practical applications for teaching math to younger students. Kit: Lego Classic Baseplates, Lego Classic Creative Box, Lego City ATV Race Team, Lego Classic Bricks on a Roll, Lego City Police High Speed Chase, Lego Classic Bricks Bricks Bricks, Marbles. New to coding? This strand is designed for you! Participants will explore learning to code online as well as using basic robotic type equipment/gadgets. Coding is basic problem-solving and computational thinking, providing a set of instructions or tasks that need to be completed in a specific order while incorporating imagination, creativity, perseverance, determination, and many other academic skills. Participants will become familiar with a variety of different types of coding and be able to return to their classroom with the knowledge and experience needed to start teaching their students beginning coding skills. They will also work with several different types of robotic equipment and learn how it can be assimilated into their own classroom. 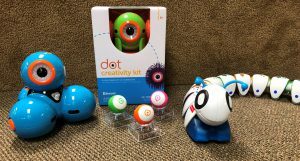 Kit: Dash and Dot, Robot Code and Go set. Explore the human organ systems as a framework for science education. Participants will study the individual human organ systems and the relationships between systems. For example, learn how the skeletal system works with the muscle system to produce movement. Multiple disciplines will be integrated with human anatomy like chemistry (Calcium is important but why so hard to get? ), biology (how does bone grow by cell division or the cells getting bigger? ), and physics (muscular-skeletal levers). Content and material can be easily be adapted to different student levels and interests.